On February 6, the Supreme Court unanimously struck down the laws against physicians helping someone end their own life (assisted suicide) and actively ending someone’s life at their request (consent to death). Individuals seeking help must have a grievous and irremediable medical condition (which may be due to illness, injury or disability) to qualify, and assistance must be provided by a physician. These changes take effect a year from the court’s decision: February 6, 2016. At first blush, this seems like a landmark victory for those who believe religious dogma should not curtail individual choices. But that conclusion would be premature. The court’s decision only broadly sketches out a solution; the details will determine whether the spirit of the decision is honoured. Much of the debate surrounding Physician Assisted Death (PAD) was between those who believe in personal autonomy and the right to avoid unwanted suffering, and those who believe life is sacred and suffering is redemptive. Those same two groups are now trying to influence the creation of detailed legislation and regulations. These laws and rules will determine whether physician assisted dying is just a right on paper, or is accessible to dying individuals across the country. Two critical issues should concern those of us who believe in the separation of church and state: the qualification process for patients, and mandatory requirements for physicians and institutions who don’t support Physician Assisted Death (PAD). The courts have granted the right of PAD to suffering Canadians, but remained silent on how PAD will be provided in practice. Many on the religious right who have long opposed PAD in principle are now working to ensure it is virtually inaccessible in practice. While thoughtful supporters of PAD accept the need for regulation, they are rightfully concerned about some of the requirements being proposed. For example, in a recent piece, evangelical politician Preston Manning proposed such requirements as the existence of a living will and consent of immediate family. These requirements are clearly problematic. Only about 20 percent of Canadians have living wills and, in any case, previously documented wishes should have no jurisdiction when patients are competent to make their own decisions. 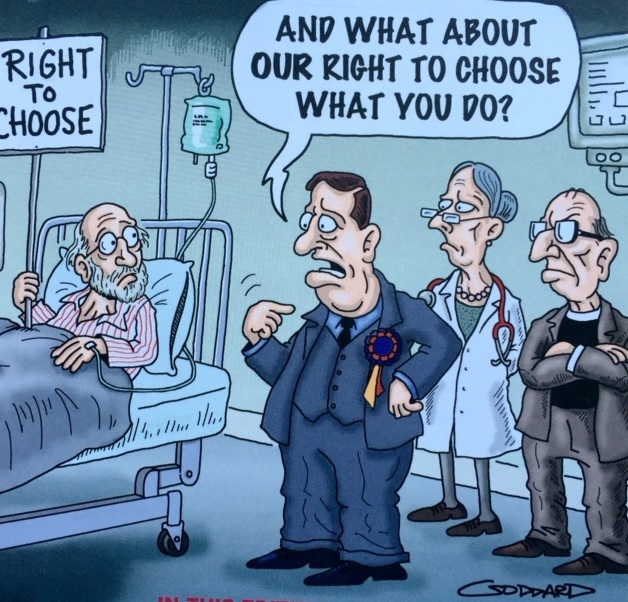 Some individuals will choose physician assisted death even though their immediate family opposes it, as is their right. Other proposed restrictions are equally problematic. For example, mandatory psychiatric assessments and mandatory judicial assessments will add costs, take time and, in most cases, add no benefit to the assessment of competence performed by the physicians already involved. Such rules, if enshrined in legislation or regulation, will narrow eligibility and render the Supreme Court’s decision moot. What are the duties of physicians and institutions? The court’s decision does not compel physicians to provide physician assisted dying, and it is unlikely lawmakers will do so. But what about a physician’s duty to provide information or refer a suffering patient to a willing provider? Some physicians believe they should be able to refuse to refer a patient to another doctor – or even to provide information or answer questions. This would severely restrict the rights of their patients. Similar issues exist for institutions. Can bricks and mortar claim to have a conscience? Can the moral and religious worldview of a hospital board or hospice administrator trump those of the doctors and patients? Can an institution receive public funds but deny individuals rights affirmed by the Supreme Court? Imagine a patient on her deathbed who wishes to exercise her right to a physician assisted death. If her doctors refuse t o discuss assisted dying or provide a referral, her options are near zero. She is unlikely to have the energy to advocate for herself. And even if she does, what options will she have? Similarly, if a patient is at an institution that won’t provide PAD, he must be transferred by ambulance to another facility to receive it. This transfer must be initiated by a doctor, there must be an institution nearby that does allow PAD, and that facility must have space. More likely, the patient will be unable to negotiate such a transfer and will end up dying as if the Supreme Court’s unanimous decision had never been handed down. These are significant curtailments, but things could get even worse. If publicly funded facilities are exempt from providing PAD, what is to stop churches from taking over more and more institutions to further curtail access? This is not a hypothetical question. Since laws were passed permitting PAD in Washington and Oregon, the Catholic Church has been actively acquiring institutions in those states and reducing the availability of PAD.